Summer is just around the corner and you’ve been waiting to host the movie nights in your garden or backyard. For making your movie nights special, we have brought you a list of some special outdoor projectors you need to consider before you go shopping to buy one. You will be confused when a bulk of projectors will come in front of you. So, sit and relax, you don’t have to go anywhere, just shop online. 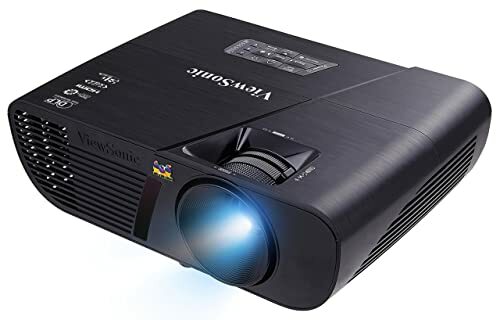 We have made a list of top 10 best outdoor projectors of 2019 to buy online at Amazon. How to Choose the Best Outdoor Projectors? Q. What is the best time to set an outdoor projector? Q. How much brightness is needed for an outdoor projector? Q. Where should you mount the projector? Q. Where should you place your screen? Q. How far should you place the projector from the screen? The quality of pictures and videos is the most important feature in any projector. Clearer and sharp images offer the best display. The high-resolution feature is also available in many low budget projectors. Just search a little more to get the best one having good qualities with less cost. There are mainly 3 types of projection technologies which people prefer the most. One is an LCD projector which is the most common choice. Its liquid crystal display produces an excellent image and bigger view at affordable prices. Secondly, DLP is also a good choice. It is a bit expensive than LCD with vibrant colors due to its advance wheel system of colors. Another choice by the viewers is LCOS. They are highly expensive and has the best quality of projection with a sharp and vivid display. 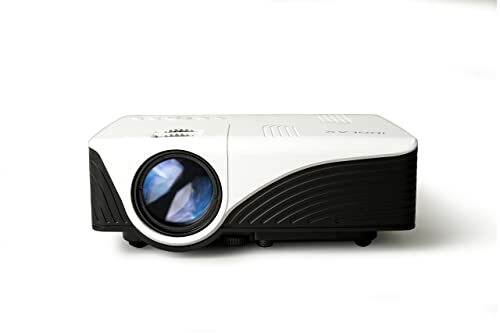 Illumination or brightness of the projector is another most important feature to consider at the time of purchasing. Always make sure that the picture from the projector is brighter. The term for brightness for these projectors is known as Lumens. For outdoor screening at night choose a projector between 2,500 to 5,000 lumens. The darker the area, the brighter is the projection. The price becomes high as the number of lumens increase. After the quality of the picture, the quality of sound is also an important feature. Some projectors are available with a built-in audio system, some with external speakers. But always select the one with both internal and external features. So, if you want louder audio you can easily attach the external speakers. Many projectors come with a variety of connectivity features like USB, VGA, and HDI. These connections give you multiple choices to connect your devices into the projector. You can also connect devices wirelessly through Wi-Fi and Bluetooth in some models. BenQ DLP HD 1080p Projector (W1070) is an amazing outdoor projector which offers a great picture quality even at a very low price. It has a Full HD 3D display with a screen size of up to 200 inches. A contrast ratio of 10000:1 and the brightness of lumens of 2000. The device itself is very portable having a length of 12.3 inches, 4.1 inches height, and 9.6-inch breadth. A plastic body makes it cheap in price. You can zoom the image up to 1.3 times manually. It can convert into auto standby to conserve energy by its SmartEco technology. You can save the power of the lamp up to 70% This model has a voltage of 100-240 V and AC of 3.4 A. This projector model provides two ports of HDMI for S-video, component video, and has a Plug-and-Play ready sound system. Its 3D display feature makes your movies, sports, and TV shows clear and vivid. It comes with a battery of 2AA. Available in white and silver color. It’s excellent audio-visual is best for playing games and has no blurring issues. This model of ViewSonic is best for home and office. Its high lumen brightness of 3300 lumens is outstanding for open air in dark. It has an excellent contrast ratio of 15000:1 which clearly shows the color variation. 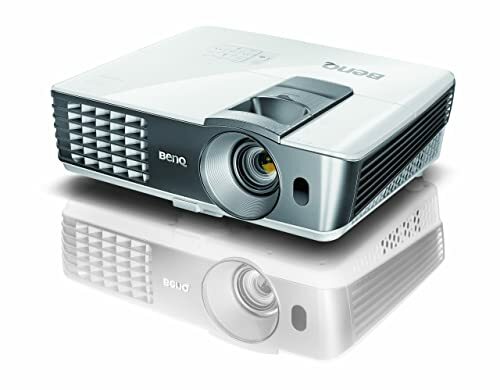 The projector has a DLP projection feature that makes your images of the high-resolution display. Its Exclusive SuperColour technology makes the scene real like never before, formed with WXGA 1280 x 800 resolution. It has numerous connectivity options including, 2 VGA in-ports, HDMI port, 1 VGA out-port, Audio (in & out), S-Video, and RCA Composite video. 3D movies can also be played through the HDMI port system. ViewSonic PJD5555W is a portable device with a weight of only 4.63 lbs. The dimensions of this item are 8.98 x 12.44 x 4.08 inches. 2 AAA batteries are required. This device has an easy setup menu, you can fit this anywhere. 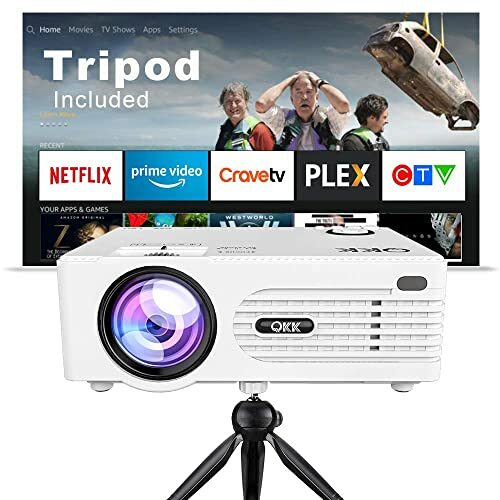 Due to its affordable price, high-quality image, good sound system, several connectivity options, and reduction of power consumption, it is perfect for movies, games, sports, and presentations & lectures at offices or classrooms. This outdoor projector is budget-friendly and gives you the features of an expensive one. The high image quality and 3D capability make it work as a pro. The size of the screen is 71 inches and 107 inches from 8 feet and 12 feet respectively. This illumination or brightness is of 3200 ANSI Lumens. The dimension of the product is 4” x 12.4” x 8.8”. It is lighter in weight of only 5.5 lbs. The contrast ratio is better than the other competitive product which is 25000:1 ratio. The black color provides more clarity to the images by the adjustment of the lamp. The life of the lamp is 6500 hours. Two ports of HMDI are available in the device for connection, one of them has the MHL potential. The result of the pictures is so clear with vibrant colors. It also prevents the extra loud noise or shades in the image. The projector comes with a light rainbow effect which makes the older movies clearer and more colorful. Optoma HD26 1080p 3D DLP Home Theatre is available in white color. For incredible picture quality and HD views, Optoma S316 Full 3D projector is the best choice for you. The 3D capability makes your movies and games beyond the normal fun. It entertains you by its amazing features like the powerful brightness of 3200 lumens and an outstanding contrast ratio of 20000:1. It conserves the energy and the lamp life lasts for 10000 hours. The item dimension is 4 x 12.4 x 8.8 inches and weighs about 5.2 lbs. which is lighter than Optoma HD26 1080p 3d DLP Home Theatre. 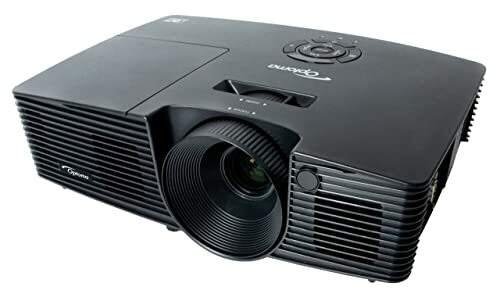 The projector has sharp texts and graphics which is best for presentations in classrooms and offices. Easy installation helps you to set up this projector anywhere outdoor. Multiple connectivity options are available like S-Video, VGA2, HDMI port, audio ports (in & out), and composite video. Buy DLP-Link 3D glasses so that you can watch 3D movies easily on S316. The rapid and quick features include fast Power On & Power Off, rapid Resume, and logo capture. It also provides wireless presentation through VGA dongle. This outdoor projector is popular for its low price with excellent features. You cannot find a projector like this tiny multimedia device in such affordable prices. It can be compared with other high-valued devices with the same features and those expensive ones are sold with 4 times higher rates than this portable device. iDGLAX iDG-787W comes with a native resolution of 800 x 480. But it is able to work like 1080p input. Brightness is 2000 LUX Lumens which is equal to 50 ANSI Lumens, it is best for outdoor night plans. Item weighs 2 pounds with dimensions of 6.62 x 3.07 x 8.19 inches. You can clearly differentiate the colors with its amazing contrast ratio of 1000:1. Its display technology is LCD for display and LED for the light source which combinedly makes it project a good quality image. Its smart and portable design is easy to carry and can be installed trouble-free. A variety of connectivity options are available in the device by which you can easily connect your iPhone, Android phones or tablets. You can also connect game devices like Xbox, PS2, and PS3. Or simply connect your TV Box and enjoy it on a bigger screen. Connections include USB, VGA, HDMI, SD, Audio out and AV input. Dr. J is an upgraded 2018 version with Bluetooth support system and brightness of LED video projector has increased from 10% to 20% lumens. Now the brightness is upgraded to 2000 lumens which are 70% extra brighter than other mini projectors. The native resolution in the system is 840 x 480 and the supported resolution is 1920 x 1080. The amazing picture colors can be seen by the contrast ratio of 2000:1 and an aspect ratio of 4:3/16:9. You can now connect the Bluetooth speakers to the system for more enhanced sound for outdoor. The lamp has a long life of 40000 hours. You can watch the large screen of 32-176 inches from the distance of 1.5-5 meters. 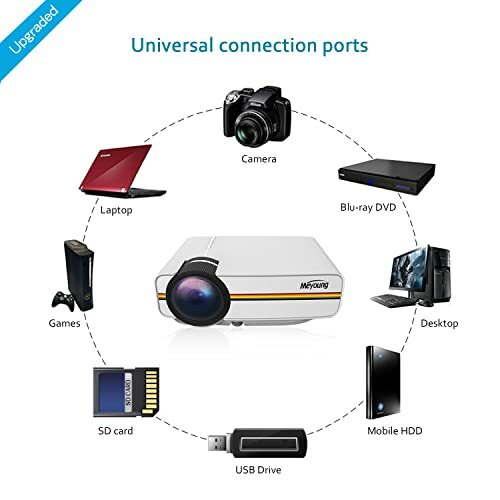 You can also connect other multimedia devices into the system such as PC, Laptop, Chromebook, TV Box, SD Card, Blu-Ray DVD Player, WII, Xbox, PS4, smartphones and much more. The system has a display of 5 layers LCD Lens which focuses on every minor detail and makes the quality of the picture clear. The device weighs 3 lbs. and dimensions of the item are 2.7” x 6.02” x 7.8”. It has an amazing top-quality brightness feature of 3000 Lumens. It enhances the colors and is accurate for white light. Epson VS240 SVGA 3LCD projector can be easily used outdoors where there is some light or indoors in bright rooms. You can have this amazing device compatible with basic graphics and presentations at a very reasonable price. The SVGA resolution of 800 x 600 makes the quality of the picture outclass. This device comes with a button of E-Zoom Plus option in the remote controller to zoom the image and its bigger display. The quick and easy set up lets you move it anywhere with you and install it conveniently. Device’s dimensions are 9.2 x 11.7 x 3.2 inches and possess a lighter body weight of 5.29 pounds. The light lamp has a long life of 10000 hours. You can instantly power off the projector, pack up and ready to move. Easy mute and sleep mode system is available in the device. It supports the latest technologies and devices to connect through its VGA, RCA, and HDMI ports. The projection of the picture from the distance of 80 feet is 60 inches. The 1W onboard speaker boosts the quality of sound. The updated version of QKK Mini Projector is the best choice for outdoor and indoor screening. Due to its mini body, it is lighter in weight of only 3.09 lbs. This LED projector supports Full HD 1080P. It has an amazing display which has a resolution of 1920 x 1080. The device is perfect for its contrast of ratio 2000:1. The ideal screen of 120 inches can be seen with a distance of 3.5 meters. 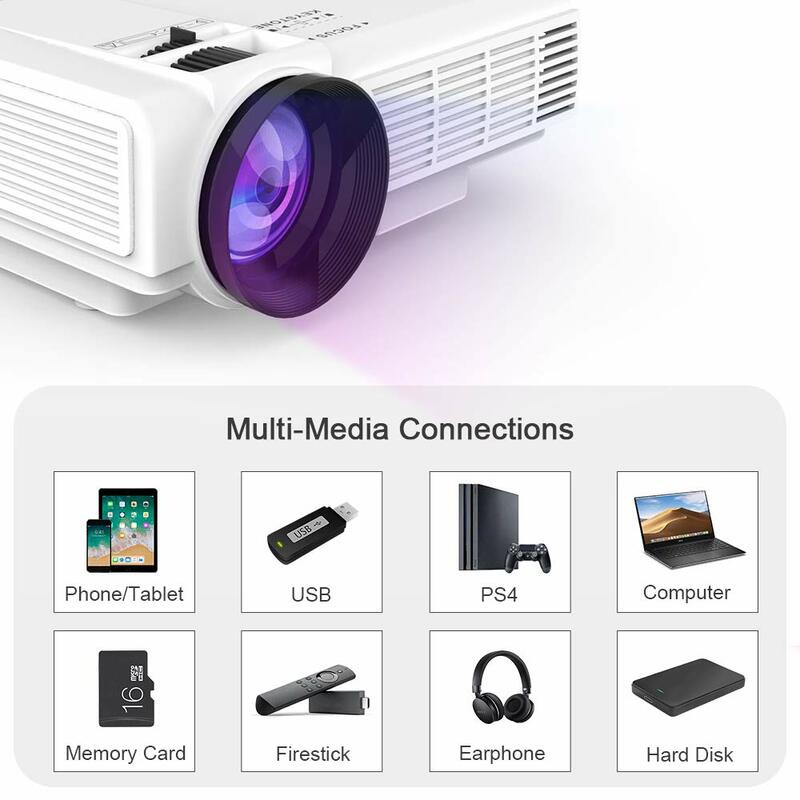 The Full HD projector supports multimedia devices like TV Box, Amazon Fire TV Stick, PCs, Tablets, USB flash Drivers, Laptops or smartphones through several ports like HDMI, VGA, SD Card port, and AV port. It shows the best result in proper darkness. The brightness level is 2200 lumens for the excellent display. This model of outdoor projector is amazing for games and movies due to its big screen size. The size of the screen varies from 50-130 inches, which is excellent to watch sports. The display is full of rich and vivid colors with a brighter screen of 1200 lumens. Meyoung TC80 has a native resolution of 800×480 and supports 1080P. The device consists of a built-in loud amplifier speaker. It supports connections like smartphones, laptops, Blue-ray DVD players, HD games, etc. The item is 7.80 x 2.68 x 5.75 inches in all dimensions. And it is the lighter in weight from all of the above-mentioned devices of just 1.98 lbs. The lamp-life is up to 30000 hours. It is also good for presentations which can be changed by a remote controller. This outstanding outdoor projector gives you the best features at a low price. Its most amazing feature is the color and white brightness of 3000 lumens which makes the display 3 times brighter than an ordinary projector. It gives you an experience of cinema with its wider screen of up to 300 inches. 720p resolution image is projected at an aspect ratio of 16:9. Loud integrated speaker is present in the device. The dimensions of the device are 11.7 x 3.11 x 9.2 inches which makes it portable to carry easily with a weight of 5.3 lbs. It comes with a control function to zoom and focus easily. The contrast ratio of 10000:1 project the picture with balanced colors. You can connect several devices through VGA port, HDMI port, S-Video port or composite video port. A. If you want to set up the projector outside in your garden or backyard, the best time is to place it is after sunset. If you are setting this up in a little brighter area, then you must have a high-brightness lumens projector. A. For darker rooms, the minimum brightness of 1200 lumen is required for better projection. However, if the area is bright (daylight) then you can use high brightness like 3000 lumens or more. A. If you are using the projector inside of the home you can mount it permanently on the ceiling or wall to save the space on the floor. But, if you have to use it outdoor, you can place the projector on a table. You can adjust it according to your preference about the screen size. A. If you are having fewer viewers to watch a movie with you then you should place the screen between 24 to 36 inches above the ground. But if you are hosting a big movie night with a number of people than you can move the screen higher. A. Usually, the distance or throw ratio of the projector is written in the manuals. But now, most of the projectors come with the zooming and focusing options. But the ideal throw ratio can be calculated as the distance of the lens from the screen or D (written in the manual) divided by the image width (W) that the projector projects. By calculating the throw ratio with this formula (D/W) you can get the perfect distance where you should place the projector. Everyone wants a perfect movie night at weekends with friends and family. But it can only be perfect when you have a good quality projector. 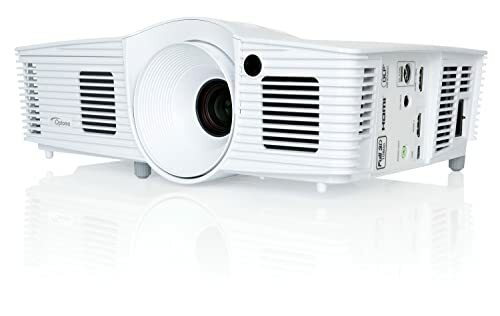 An indoor projector of any quality might look good because of the darker environment. But it is very difficult to have an outstanding image quality outdoor due to the incoming lights from surrounding. So, to make your night perfect we gathered some amazing quality outdoor projectors which you can use in your garden, backyard, roof or terrace. These projectors have all the amazing features at an affordable price. You do not have to go to an expensive one. On these projectors, you can watch movies, sports, play games and even can play any other media on the big screen which gives you a cinematic experience. The best feature that an outdoor projector must contain is the high-brightness lumens. If you are planning to watch outside in the dark than brightness power of 2000-3000 lumens is perfect. If you will go for more brightness power than the price will also increase. The native resolution for a good quality projector must be 1920 x 1080. The better the resolution, the clearer are the images. Also check the features like good sound quality, screen size, contrast ratio, lamp life and of course the important one, the affordable price. Now you don’t have to spend hours for the movie night preparations. These handy portable devices are easy to install anywhere, anytime! These projectors also make your professional presentations marvelous. If the sound is not clear due to the outdoor environment, you can also attach the external speakers to enhance its volume and sound quality. So, if you don’t want to ruin your perfect night, choose any of the above projectors and order online from Amazon right now!